The Ultimate Guide To Launching A Successful Blog – How to start a blog and make money blogging – How to start a self hosted WordPress blog – How to set up WordPress step by step – How to start a blog step by step. This post is updated regularly with new and relevant information and tools to help you make the most successful, money-making blog imaginable! If you’re brand new to blogging, it really helps to have someone to point you in the right direction and help you avoid fatal mistakes. Many ‘Start A Blog’ tutorials I found only promoted a host and that was it. They didn’t really help me set anything up. In this comprehensive guide I am going to walk you through how to start a blog that can easily be monetized, by setting up a self-hosted WordPress.org website with Bluehost! Start growing your blog & monetizing! It is 100% okay to feel overwhelmed at first. You think there are a million things you have to do, a million posts, pages, graphics. I get it! But blogging is a marathon, not a sprint. Do a little each day, commit to always learning, and don’t give up! I’m always here to help you along your journey. But I want you to get comfy, this guide isn’t one of those ‘launch-a-blog in 5 minutes’ guide. No, we go into great detail here. Make sure you have 20 to 30 minutes to focus entirely on this. I’m going to hold your hand through this entire process of setting up your self-hosted blog, so you can get it right the first time, without any of the frustrations or headaches I experienced with my first blog. Are you ready to create your blog today? Let dive right in! Before we can even get into making your blog pretty and generating an income, we have to decide on a blogging platform. However, WordPress powers over 30% of the entire web (1) and has a market share of 60%. It’s clear which platform is the best. Its very beginner friendly to set up – You don’t need to be a coding genius to set up a blog on WordPress. I’ll show you how in a bit..
It’s safe and secure – WordPress works hard to make sure it’s software is safe and secure, they are constantly updating it. That’s why sites like NASA, Microsoft, and major universities use it (2). Anything that gets Bill Gates stamp of approval is a win in my book! It EXTREMELY customizable – There are hundreds of free themes (on top of thousands of paid ones) and plugins that can make your blog extremely personal and unique. The other sites are okay, but nothing comes close to the limitless options WordPress offers it’s users. Without a sliver of doubt, you want to go with WordPress. Setting up a blog like this is much easier and less expensive than you might think, especially with the link I have for you below…. Alright, we’re starting to get to the fun stuff! Domain Name : This will be your blog address. Don’t sweat coming up with the perfect blog name. Pick something relevant to your what you want to blog about, or use your own name! Some major six figure-bloggers like Neil Pateil have done this. The cost of a domain is about $10 per year, but if you follow this guide I’ll show you how to get one for much less. Web Hosting : This will be the framework and home for you content. Without a web host, you won’t be able to use your domain. Think of hosting as a computer hard drive that houses all your files, pictures, videos, etc. The cost of a high quality host is somewhere between $10 – $15 a month, but readers of my blog get their first year for much less! It’s a relatively small but vital investment for your long term blogging success story. Uptime – How often your site is up and running. Believe it or not, 99.9% isn’t enough, that’s equivalent to 43 minutes of downtime a month. We want 100%! There are thousands of providers out there and they all offer relatively the same service (domain and hosting) for similar prices. Basically, with Bluehost, your site will look legit and trustworthy from Day 1! You can always go with another web host, of course, just make sure it’s fast, reliable, and offers you unlimited storage and bandwidth! This will save you trouble later on. Okay, the basics of blogging platforms are done! Now we go on to set up your site! If you decide to host with another provider, you can skip this step and meet me in Step 3! Here you pick your plan. When I first started, I picked the Basic plan but quickly realized I needed Domain Privacy. When you add Domain Privacy later, it ends up being about the same as the Prime. Domain Privacy basically means no one can look up your name, address, and phone number on Whois. Regardless of what you decide, you can lock in the promo price that Bluehost offers. If you register with them for three years, you’ll get that special rate for the entire 3 years. After that, it’ll go back to a non-promo rate. Next up, you can register your domain! Enter the names you wish to use and Bluehost will let you know if it’s available or not. Likewise, if you have a domain registered somewhere else, you can add it here now. There’s no clear-cut way to choose the ‘perfect’ domain. Easy to remember – Don’t choose a long name, a word that’s tough to spell, or something filled with dashes. No one will remember a site named like www.the-super-mom-does-it.com, but something like www.supermom.com is very memorable. Unique and Descriptive – You want it to be a reflection of who you are and what you’ll blog about. Just make sure you don’t pigeon hole yourself. A site like ilovecooking.com might limit you to just the cooking niche and as your site grows, its very possible your interests do too. Put your desired domain name in the box and if it’s available you can register it! If not, try another one. Mix and match synonyms until you find the perfect one. Depending on what package you select, this will look slightly different for you. If you’re serious about blogging, I’d recommend locking in your rate for 3 years, but that’s completely up to you. Also, the Package Extras, the only one that you should add at this point is the Domain Privacy!! Sorry to be a broken record you guys, but you need to be safe on the internet! This will be your login to access all your websites information and hosting, make sure it’s one you will remember! But also, make sure its difficult enough that someone can’t guess it. Even with a small blog, hackers will try to get in. You can either click ‘I Can Do It’ or close the pop up as I will be guiding you through the next steps. Okay, now that you have a domain and a hosting plan, we can start creating your blog. Click the Icon and you will then be prompted to install WordPress. Click Install, give your new WordPress site a name and attach it to your domain. Fill out the information to set a username and password for the new admin to WordPress. The new admin is you and you can put any name here you like. This login information is what you will use to log in to your site to create post and content – so again, make sure its something you can remember but isn’t easy for hackers to figure out! While WordPress is installing, you will see a green bar at the top of your screen showing its progress. You may be prompted to choose a theme from Mojo Marketplace, it’s not necessary but you can definitely check it out. You can always access your login page by typing http://www.yourdomain.com/wp-admin into your address bar. On the left hand side, you will see tabs to create posts and add pages. In Section 4 of this guide, I will walk you through creating your first posts and pages, so just have a look at it now if you wish, but we still have some tech-y things to take care of! All the following steps are very important if you wish to monetize your blog and make it Search Engine Friendly. Don’t skip these sections! Locate SSL Certificates, and click on the learn more button. Click the get started button under WordPress Free SSL. Once you’ve turned the SSL on, it can take a few hours to install and activate. In certain situations, you may need to take action to complete the process. If that’s the case, you’ll receive an email with instructions to follow. Once complete, you will have a working SSL certificate for your domain name! You can access this dashboard by going to https://yourdomain.com/wp-admin and entering your password. Congratulations!! You are the proud owner of you very own Self-Hosted Website that can be monetized from Day 1! Create a free Google Analytics account. Install this free plugin to easily install and monitor your Google analytics within WordPress. Follow the plugins prompts to authenticate your account. To easily connect your blog to Google Search Console, make sure you have the Yoast Plugin installed. Just download the free version, that’s all you’ll need for now. 1. Head on over to Google Search Console (formerly Google Webmaster Tools) and sign in with your Google account. 2. Once logged into Google Search Console, click the red “Add a Property” button to add your website. ‘Property’ means website in googles world. 3. In the popup, add your website URL and click the blue button. 4. Click on the‘ Alternative Method’ tab. You will be given a code. Copy the code, and then paste it into your website <head> section, before the <body> section. If you aren’t sure how to do that, this free plugin makes it super easy to put code into your <head> section: AddFunc Head & Footer Code Plugin. Once you have done that, you can click ‘verify’ in Google Search console. 5. Now, head on over to your WordPress dashboard and on the left hand side, click ‘SEO’ and then ‘Search Console’ which is Yoast’s way of connecting your blog to your Google Search Console. Your website will now be connected to Google Search Console and Yoast. 3. View your XML Sitemap by clicking the ‘See the XML Sitemap’ link. You may have to click the question mark ( ? ) symbol to see the link. Lets start off with changing your theme. When it comes to choosing a theme, you have thousands of options. What’s most important to remember here is to pick a theme that’s responsive, meaning it automatically converts to a mobile-friendly version when viewed on a cell phone or tablet. Premium themes come with support and updates from the developer. You can always contact them if something goes wrong. The look and feel of your site is the first impression you give off. People will view your site and in a couple of second decide whether or not you are professional enough to follow, subscribe and even purchasing from. Once you have chosen a theme you like, purchase it and download it to your computer. It will be a ZIP file. You’ll see your WordPress comes with some themes already installed. You can peruse this section and here is where you can find a free theme easily and quickly. Once the file is uploaded, click ‘Activate’ and you’re done! You have installed your WordPress theme! Chances are you won’t be ranking on the first page of google anytime soon, but regardless, we have to set the foundation so you can have some organic traffic. These steps need to be done before you start creating posts and pages because if done after, it just messes up your whole site! There are two things we need to take care of. Search engines absolutely hate ugly URLs. They’re obnoxious and you’re likely going to get tons. Yoast makes setting up SEO (Search Engine Optimization) on your website super quick and simple. It suggests ways to improve your posts so that you rank higher in search engines like Google. Every blogger has this plugin and for good reason! There’s a free and paid version but you just need the free one for now. Cache plugins are used to speed up your site. This one is great because it saves a static HTML version of your website, instead of generating pages one by one. This takes less strain on your server, creating a faster more user-friendly site, and ultimately better search rankings. JetPack may be one of the best free plugins out there (and a complete necessity), it combines several must-have blog features that you would normally have to pay for elsewhere. They offers analytics, anti-spam & security, social share buttons, and so much more. You need to be backing up your site, and this free service allows you to backup and store the files to a storage app of your choosing such as Google Docs, Dropbox and others. Adds a ‘Pin It’ button when you hover over an image, so you can easily pin images to Pinterest. This is the free version of Pretty Link. The free version allows you to cloak links. It is a tool that takes any regular link and makes it ‘pretty’ by using your own domain. It also makes it easier when writing a post as you don’t have to go back and search for a link, it saves them all in one convenient place. This plugin is a must, especially if you want to make money with affiliate marketing. You don’t want to risk losing out on commissions as a result of links not working! This plugin automatically checks your website for any broken links and sends you an email whenever it finds one. Click the link below to the plugin you want. It will lead to it’s download page. Click ‘download’ on that page and it will be saved to your computer. You do not need to unzip this file, just leave it as is. If you’ve made it this far, I am SO incredibly proud of you! At this point you should have a fully functioning WordPress blog on your own domain. You also already have a beautiful blog theme set up. For the purpose of comparison, when I launched my first blog without a guide and it took me THREE WEEKS to get everything up and running.. and even then, I hadn’t set up certain things correctly. This step is the one you’ll consistently be using. Creating blog posts, adding images and links; this is the life of a blogger (which you now are). Welcome! In the top field, you place the title of you blog post and you place all your content in the big box below it. On the right-hand side, you will see a little box. Here you can publish your post so the whole world can see it, or save it as a Draft and work on it later, or even schedule it to be published at a later date. You’re (most likely) going to posts links to other websites or even to your own posts. Google loves links! To add a link, click on the icon in the toolbar that looks kind of like a chain link. URL – where you put the web address of the link you want to share. Make sure to include the entire link, ‘http://” before the ‘www’ or your link won’t work. “Open link in a new tab” – I recommend always checking this box. If not, when someone clicks your link, they’ll leave your blog. 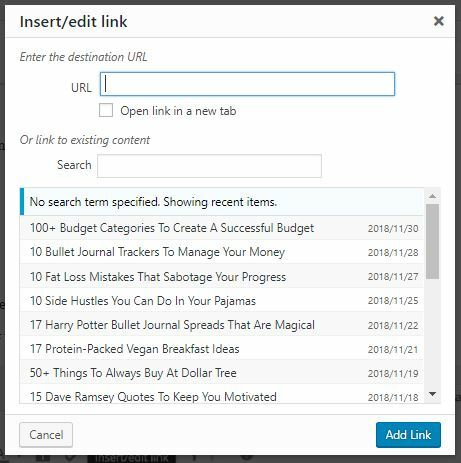 “Or link to existing content” – here you can search for an existing page or post within your blog and link to it. Just use the ‘Search’ section to find the post. IMPORTANT: Make sure to leave your cursor inside the blog post, right where you want the photo to be placed before clicking ‘Add Media.’ If not, you’ll have to move it later and it can distort your post. Once you’ve found the image you want to upload, double-click it and WordPress will automatically upload it. Once the image had uploaded completely, select it and hit “Insert into Post” to place it into you post. As you can see from this post, I have created various sections and broken the up with headers. To add a heading, simply click the drop-down menu on the bottom left of the toolbar. You will write most of your blog posts in ‘Paragraph’. Also, try to only use ‘Heading 1’ once in your blog post and use ‘Heading 2’ or the others throughout your blog post as this is better for search engines. FYI, you can highlight the text you want to change and then click on the drop-down menu and select the format you want the text to appear in. Whatever works best for you. Congratulations on getting this far!! Now it’s time to start creating content and making your blog successful. As a rule of thumb, I recommend you get at least 10 blog posts out there before you start worrying about traffic and gaining readers. The last thing you want is to go viral on Day 1 and only have two posts up!